Back in November I disconnected my Facebook account. I had hoped that when the 2016 presidential election was over that people would be able to go back to talking about life as we knew it. I missed talking about computer programming and science fiction. Every single day was filled with anxiety by everyone about what the future would bring. Things got progressively worse after the election in a way I didn’t think was possible. I had people who voted the same way I did viciously attacking me for not completely supporting their views 100%. It got too demoralizing to deal with everyone anymore because everyone was so angry that I simply quit. I couldn’t deal with it anymore. This left me rather lonely. I started writing a book back in October. I find it difficult to leave my house regularly without completely exhausting myself. I certified my pug Delia as a service animal because I found dealing with the outside world too difficult to cope with. I don’t have any local friends anymore and it’s difficult to find people to hang out with. Back in March I had two rather intimidating conferences I was attending. One was GDC. The other one was iOSCon 2017. This post is about my experiences with these conferences and how important our community is to me. GDC is by far the largest conference I have ever been to. I was fortunate enough to be accepted as a conference associate. I got to attend the conference in exchange for helping to make sure the conference runs smoothly. My first conference was Snow*Mobile in Madison. The organizers of that conference let me attend the conference in exchange for volunteering to help run the conference. I got to hand out conference badges and meet the speakers and it was an invaluable experience. I always prefer to not just attend a conference and I was incredibly grateful to be accepted as a conference associate. 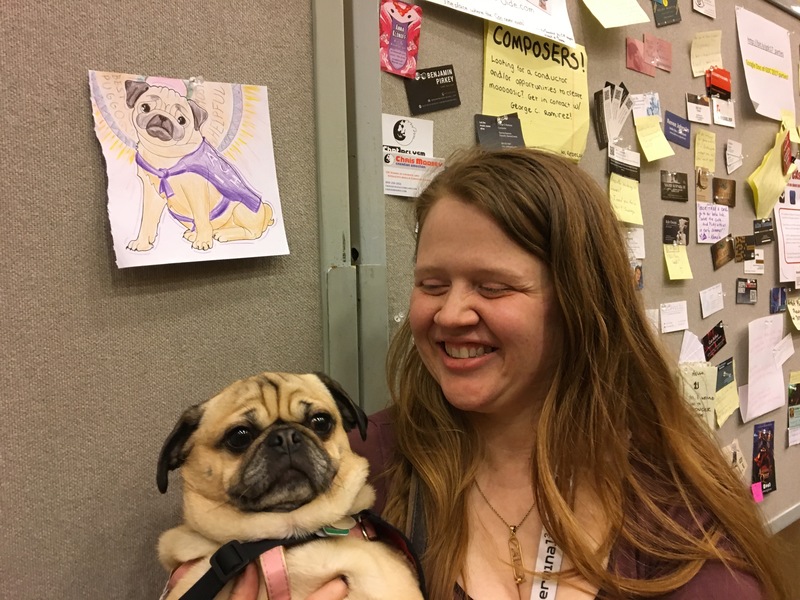 Delia and I greeting at GDC. People asked where the pug was later and were sad she wasn’t a fixture at the front. I was afraid if I told them that I had a service animal that they would think I would be unable to perform my CA duties. I should have been up front and told them immediately, but I figured if it wasn’t okay to bring Delia that I would leave her home and try to find a way to cope. I didn’t need to be worried. Everyone in the CA program was absolutely fantastic about having Delia there. She and I were accepted by everyone. A lot of people took comfort in having her around and it really made that conference special to me. I love my pug, but I am biased. I worried that people would think that I was pulling a con and I wasn’t really disabled because I don’t have a physical disability. I worry that people think I am like Paris Hilton carrying my dog around just because I have privilege rather than her being something that helps me cope with crowded noisy situations. Having so many people enjoy having her around really touched me in a profound way. Someone was spoiled with all the pettings. 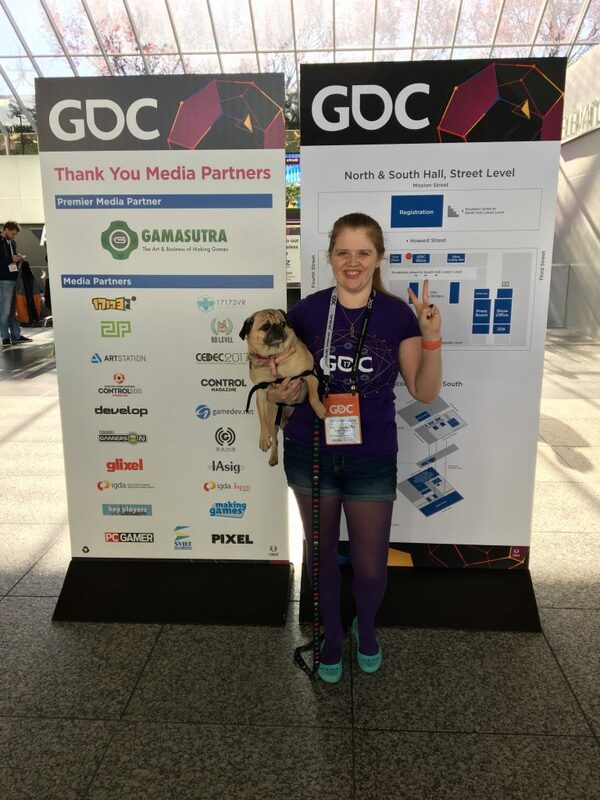 Getting to attend GDC was a life changing experience for me. I met some of the greatest people ever. I feel incredibly blessed to have been able to connect with such a fantastic group of positive and accepting people. One of the big things they look for in a CA is someone who is friendly and positive. A lot of people there acted as mentors to students trying to break into the game industry. The CAs were a creative and colorful group of people. I felt like I could completely be myself and that it was just fine. I take pride in my weirdness and my craziness, but I do feel a lot of pressure to tone it down and conform at iOS conferences. When I got home after the conference I felt surprisingly energized. I realized when I got home that I hadn’t heard anyone talking about politics or arguing about it for the past week. Everyone I interacted with was positive and happy to be there. I made a lot of new friends. I got to be in a completely non-toxic environment for a whole week and it was amazing. Someone drew a picture of Delia and put it on the bulletin board. I may have cried a little. iOSCon was a different experience. 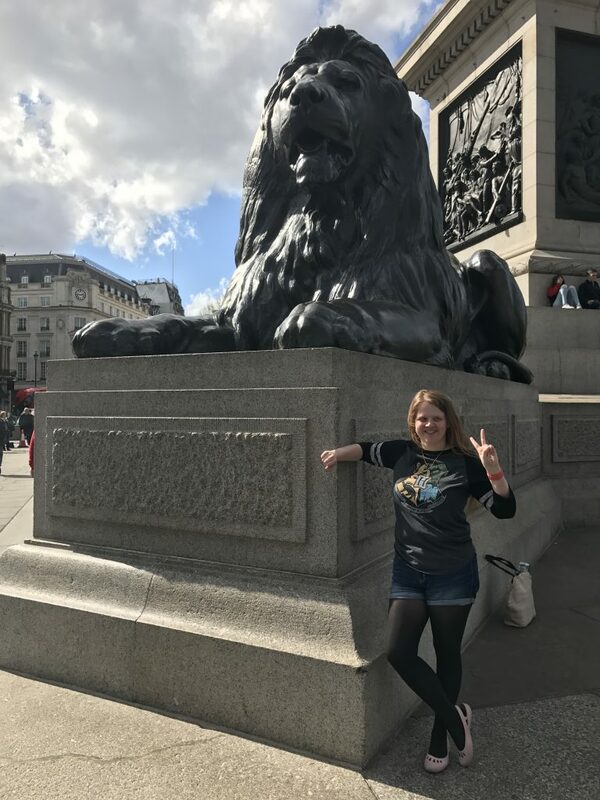 It was not as large as GDC, but it was in London. This was my first overseas conference. I had concerns about the flight over and getting around. I also could not take Delia with me. I was afraid that I would not fulfill all the correct paper work and she would be taken away at the border or I would be denied entry into the country. I also did not have any cellular service. I am not comfortable with public transportation because I live in rural Wisconsin. I was terrified of getting lost and not being able to get to and from my hotel. I have wanted to visit England forever, but I was terrified of trying to actually visit anything. One of my friends, Paul Hudson, was going to speak at the conference and lives in Bath. He invited me to take the train out there and visit the sites. I was terrified of getting lost on the train. I had no idea how to get anywhere. Paul sent me incredibly detailed directions about where to buy a train ticket and how to get there. His directions helped me figure out how to get around Paddington Station when I arrived off the plane and was suffering from jet lag. I would have freaked out more than I actually did had I not been forewarned about navigating around. When I got to Bath, he showed me around. I didn’t have to worry about referencing a map or getting lost. 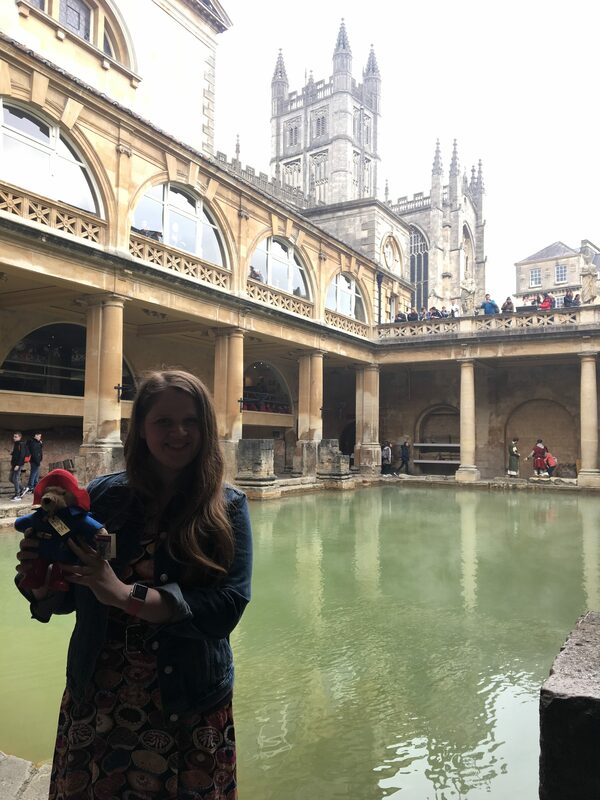 Getting to visit Bath was the highlight of my trip. If he had not reached out and taken the time to make me feel comfortable about going out there I never would have gone. I would have spent even more of my time in London hiding in my hotel room watching Law & Order reruns that miraculously still play on British TV. 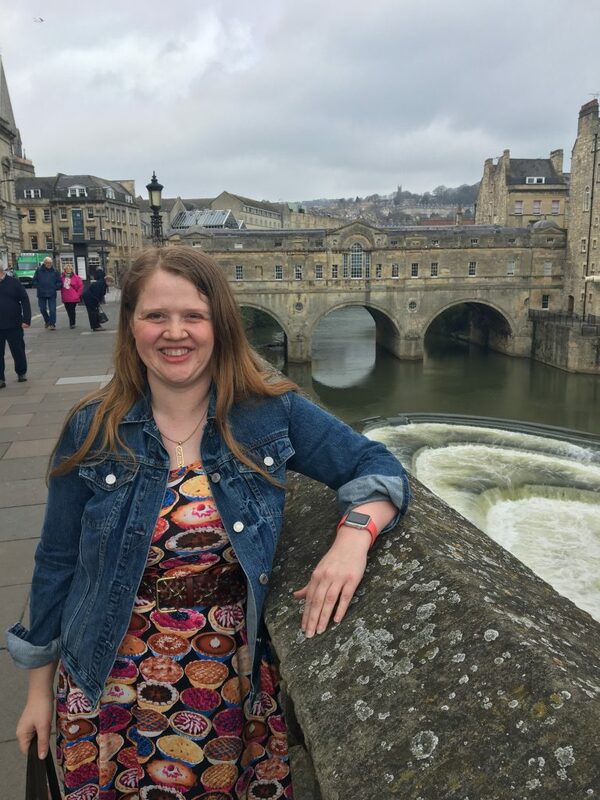 I fulfill my life’s purpose by visiting one of the world’s oldest baths in Bath. I have trouble doing things that don’t bother most people. One thing that frustrates me when I go to San Francisco is that people invite me to go out to dinner and don’t do anything to help me get there. Sometimes they don’t even tell me the name of the restaurant they’re eating at. I wind up staying in Cupertino a lot, and the idea of hopping on the CalTrain and trying to figure out the MUNI and the BART to get to a location that no one will even tell me about throws me into a shut down. I don’t like that I can’t do the same things everyone else can. I feel embarrassed having to explain that I curl up in a ball crying if I encounter multiple public transportation systems in one place when I don’t expect to. Everyone else knows what they’re doing and they get aggressive when you’re in their way because you’re freaked out and don’t know what is going on. If people want me to do things with them they need to do a little more to help me get there. I need explicit directions. I need addresses. Having the name of the place is helpful too. It’s not that I am incompetent or lazy. I just need more help. I don’t expect people to make the extra effort to help me spend time with them. Whenever someone does, it always means a lot to me. I know our community values being able to go off on your own and do things without help, but social stuff is really hard. It’s hard to go to a place you have never been and to deal with a system you don’t understand. Having a modicum of empathy for someone else and reaching out to do slightly more for them when they have trouble doing it for themselves is always unexpected and greatly appreciated. There are so many small things that people can do that take just a few minutes out of their day that can mean the world to someone who has trouble doing things for themselves. My experiences this year are making me more aware of what I can do to be a positive influence on the world around me. With so much negativity out in the world right now, small acts of kindness really mean a lot. We’re all in this together.